WILLIAM C. H. SMITH. Uncle Sam has placed in charge of the postal service in the village of Reno, Bond County, the gentleman whose name appears above. He unites with his duties as a Government official the business of merchant. Mr. Smith was born in what is now Lyon County, Ky., on the Cumberland River, near Eddyville, June 11, 1828. He is a son of Thomas and Sarah (Hall) Smith, the former a native of North Carolina, where he was born November 17, 1803. When a child his parents removed to Kentucky, and there, March 18, 1827, was married to our subject's mother. William Smith is the eldest of a family of nine children. Of this number only five are now living: our subject; Pernecy, who is the wife of James W. Jett, of LaGrange Township, Bond County, was born December 9, 1830; Elizabeth, who was born March 23, 1835, married William Jett, and is now a widow, living in Crawford County, Kan.; Nancy was born December 11, 1836, and married John P. Haley, and is a widow living at Donnellson, Ill.; and Isaac F., who was born December 31, 1840, is now a farmer at Cuba, Kan. In May, 1839, the family came to Illinois and spent one season. 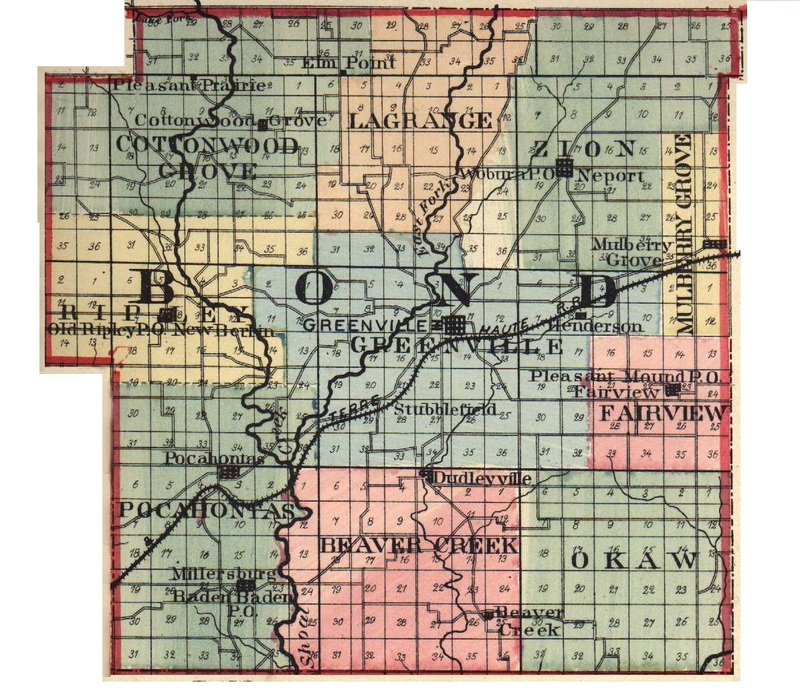 They then went to Missouri, but not finding that to their taste soon returned to Bond County and located on a farm east of Reno, where our subject's father died January 26, 1853. The mother passed away some thirteen years before, the date of her decease being December 31, 1840. Our subject received but a common-school education, and followed farming until 1873, when he became interested in the mercantile business at Elm Point, and there continued until 1881, when he came to Reno, since which time he has been constantly engaged in mercantile pursuits. Before coming to Reno he was Postmaster at Elm Point for a good many years, and since becoming a resident of this village has held the office constantly with the exception of the term of the Cleveland administration. He has been a lifelong Republican, and has served as Justice of the Peace for twelve years. From 1861 to 1864 he acted as Constable. Mr. Smith's marriage occurred July 6, 1852, his bride being Miss Nancy L. Laughlin. She died January 28, 1856, and left her husband two children: Mary Eveline, born July 3, 1853, is now the wife of James D. Baker, who is a farmer in Missouri; and Sarah M., who was born March 26, 1856, married a Mr. Carroll; she died in Reno April 2, 1887. Feeling that his children needed a mother's care he persuaded a Miss Cindrilla Gwyn to take her place as mistress of his home and heart. They were married April 2, 1857. She passed away from this life December 27, 1890. Mr. and Mrs. Smith were the parents of four children two of whom are now living: Nancy Alice, the wife of Joseph N. Curlee, who lives in Baxter, Ark. ; and Ellen M., who is the wife J. Nelson Dressor, who resides near Reno. Our subject is a man who for years has commanded the utmost respect as well as personal regard of his fellow-men. As head of his family he has been a most exemplary husband and father, and the public trusts have been guarded as carefully as though they were his individual affairs. Extracted 21 Dec 2016 by Norma Hass from 1892 Portrait and Biographical Record of Montgomery and Bond Counties, Illinois, pages 507-508.